The notification Server License users running ISL Conference Proxy version older than 4.2.0 get when trying to run an ISL Online application on Windows 7 or higher since January 1st, 2016. As you might know, the IT industry is moving from SHA-1 encryption to a vastly more secure SHA-2 cryptographic hash function, which is used for digitally signing applications. Effective January 1st, 2016 Microsoft is no longer supporting applications signed with a SHA-1 code signing certificate. ISL Online team has been preparing for this migration for several months. We added double signing support to ISL Conference Proxy 4.2.0 on June 4th, 2015. Since then, all ISL Online applications are signed using both, SHA-1 and SHA-2 hash functions. So, our Hosted Service users do not need to worry and won’t feel the transition to SHA-2 as we have upgraded our ISL Online Network some time ago and all is working properly. Server License users already running ISL Conference Proxy 4.2.0 or later will be able to use ISL Online services without any interruptions just like SaaS users. However, it is important for all other Server License users to upgrade their ISL Conference Proxy to version 4.2.0 or later. While Server License users with a valid Extended support service (ESS) can upgrade their ISL Conference Proxy immediately, Server License users with an expired ESS will first need to purchase the yearly “Updates and Upgrades”, which account for about 15% of their license value. 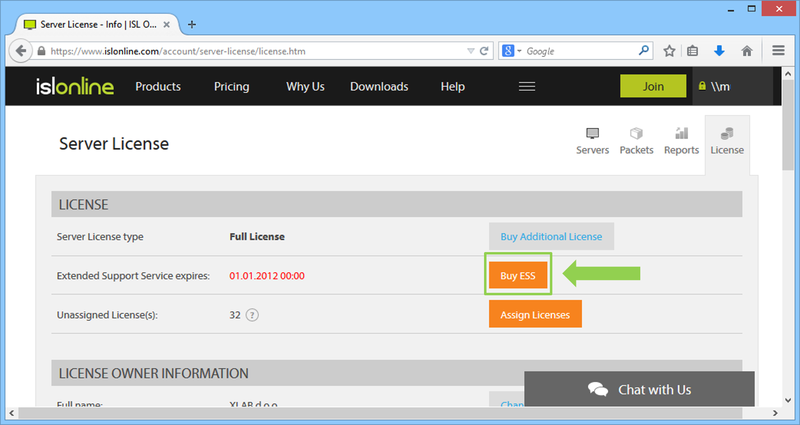 Log in to your ISL Online account, go to “License” tab and click on “Buy ESS” to extend the Service Support for one year. How to upgrade to the latest version of ISL Conference Proxy? 2. Create a new packet to get the new license file. 3. Upload the new license file to your ISL Conference Proxy. 4. Go to the server running ISL Conference Proxy. 5. Open the web administration page: http://localhost:7615/conf. 6. Log in as user admin. 7. Select Online Update and apply all available updates. If you should encounter any problems upgrading your ISL Conference Proxy, you are welcome to read our help manual or visit our live chat. This entry was posted in business as usual, corporate remote desktop, ISL Conference Proxy, ISL Light, isl online, IT support, Managed Private Cloud, On-Premises, On-premises remote support, Private Cloud, remote access, remote desktop, remote support security, security, Uncategorized, update and tagged code signing certificate, ISL Conference Proxy, IT support, remote access, remote deskop, remote support, security upgrade, server license, server license users, sha-1, sha-2, upgrade isl conference proxy. Bookmark the permalink.